Dr. Raymond Sheridan offers state-of-the-art dental bridges for tooth replacement. Losing a tooth does not have to mean smiling with your lips closed from now on. Tooth loss is a common occurrence caused by tooth decay and injury. Sheridan Dental is proud to offer patients with missing teeth a solution that can give you the freedom to smile as big as you want. 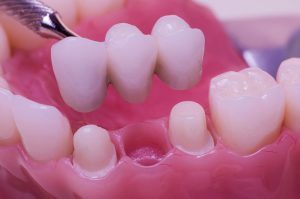 Bridges are a great option for patients with one or more missing teeth who do not have the jawbone adequate to support a dental implant, but prefer a more stable and permanent fixture than dentures. A dental bridge is composed of an artificial tooth held in place by two porcelain crowns that are attached to the teeth on either side of the gap. Getting a complete smile with a dental bridge is a short process and the results are long-lasting. Dental bridges usually take two visits to complete. Dr. Sheridan designs your new tooth using an impression of your bite and your current enamel shade as a guide. The false tooth is expertly crafted from porcelain for optimal durability and a very natural appearance. Once your dental bridge is permanently bonded in place, you can use the artificial tooth just like you do other teeth. Keep in mind that bridges are as susceptible to breakage from hard candies and foods as your natural teeth are. Dental bridges should be brushed twice or more daily to keep them in good shape. A dental bridge allows you to fill in missing spaces permanently without the surgical element necessary for dental implants. Patients looking for an initially less expensive alternative to implants may prefer a dental bridge, but it is important to note that a bridge may need replacing at some point due to normal wear and tear. A dental bridge has some drawbacks compared to a dental implant. First, dental bridges require that two of your teeth be modified to support dental crowns. Any time your teeth are modified, they may lose strength. Another drawback is that dental bridges cannot be cleaned just like a regular tooth because it is connected to the adjacent teeth. Finally, a dental bridge does not stimulate your jawbone and gums, which may lead to further atrophy. After a thorough examination and health history review, we can recommend a tooth replacement option that will deliver the results you are hoping for. Dr. Sheridan can give you all the details on dental bridges when you visit our Grove City dental practice for a free smile makeover consultation. Please contact us today. We look forward to helping you restore a beautifully balanced smile with our advanced tooth replacement solutions.